The free agent market always gets a bit more interesting in early December, after the non-tender deadline. A new crop of free agents become available, and every year it seems as though two or three players generate a ton of interest. This year Matt Diaz ranked among them. Despite his injury-shortened 2010 season, plenty of teams saw value in his bat, especially in a platoon role. The Pirates won the sweepstakes, signing him to a two-year deal. There was another, less heralded player on the market whose skills are somewhat similar to Diaz’s. Yet Scott Hairston has barely received a mention this winter. Diaz’s draw is obvious, since his value comes on offense. He owns a career .348 wOBA and mashes lefties to the tune of a career .387 wOBA. In three of the last five seasons he has eclipsed a .350 wOBA. Any team that needs to balance their lineup to better match up against lefties will find plenty of use for Diaz. Any of the 29, or maybe 28, teams that missed out on him can find similar value in Hairston. That’s not to say that Hairston’s bat matches Diaz’s in any way. He has a career .320 wOBA, though he does redeem himself against lefties with a .355 career wOBA. Those numbers, however, don’t come particularly close to Diaz’s. In addition, Diaz has hit righties a bit better in his career, a .312 wOBA to Hairston’s .300. It’s clear, then, why Diaz drew more interest. But as we know, offense doesn’t count for the entirety of a player’s value. This isn’t to say that Hairston is a better choice than Diaz. Given the choice between the two players I would take Diaz. His bat has historically been better, and while both players have had injury problems, Diaz’s haven’t been quite as bad — Hairston has hit the DL every year since 2006. But I don’t think the difference between these two has been reflected in the free agent market. Diaz got plenty of bites and ended with a two-year contract. Hairston has received little interest, and hasn’t been mentioned on MLBTR since December 18. Teams seeking a right-handed platoon bat who can also serve as a fourth outfielder can find value in Hairston. He’s not a starter, and he’s not going to put on a hitting display, but he can be a solid contributor off the bench to a contending team. I’m a little confused as to why he’s received no attention, while seemingly every team wanted Matt Diaz. 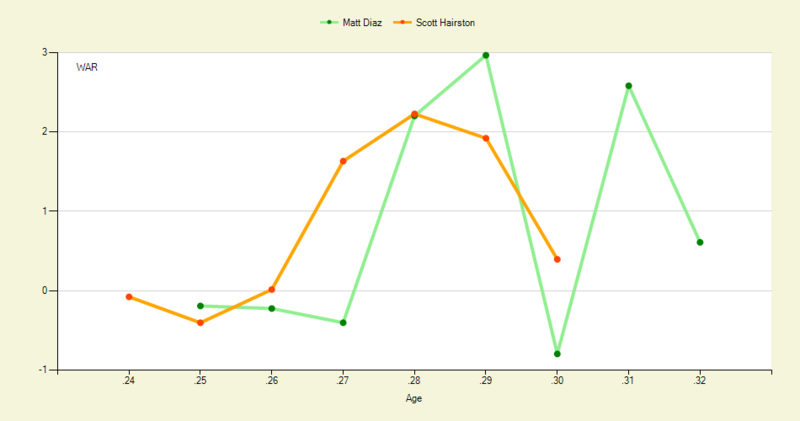 We hoped you liked reading If Diaz, Why Not Scott Hairston? by Joe Pawlikowski! Brewers’ Defense: Roadblock To A World Series? I’ve been advocating for Hairston on the Twins for months… and that was before we saw fit to dub Jason Repko as our de facto fourth outfielder yet again. Please Twins… let’s get this to happen. Minimal investment, solid defense, decent speed, and far more offense than Repko. Given the atrocity that is our bench right now, I’m willing to trade a little of Repko’s plus defense for some offense to balance out the other three bench… “bats”… we currently have.